KANSAS CITY, Mo. -- Kareem Hunt stood in front of his locker room and mused about an up-and-down season, one that was highlighted by five straight wins and low-lighted by six losses in a seven-game stretch. One that is suddenly looking up again, too. The Chiefs beat the Miami Dolphins 29-13 on Sunday for their third straight victory, clinching back-to-back AFC West titles for the first time in franchise history and ensuring Kansas City would get another game at Arrowhead Stadium to start off the new year. "Honestly, we had a lot of up and downs," said Hunt, who ran for 91 yards and a score in ending the Dolphins' own playoff hopes. "We started off hot, went through a stretch, had to bring it back together, play as a team - play hard. And we just took advantage of these opportunities, play by play, and we're back on the road to the playoffs." The Chiefs (9-6) head to their regular-season finale at Denver next week knowing they can rest their biggest names for the playoffs, a luxury of wrapping up the division a week early. 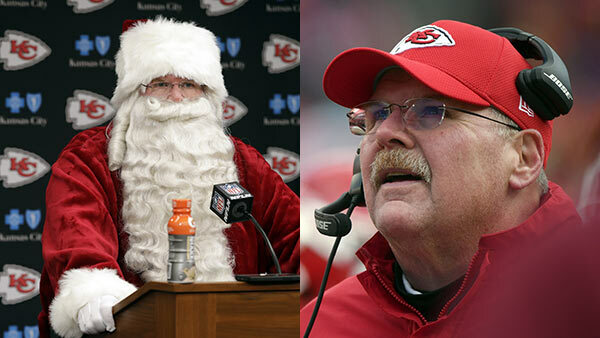 Chiefs coach Andy Reid, who donned a Santa Claus suit to address his team in the postgame locker room, said he hasn't decided what he'll do for the largely meaningless game against the Broncos. "It gives you flexibility," Reid said, "it does do that." For now, Reid wants his team to cherish a Christmas Eve victory that was dominant in all phases. Alex Smith threw for 304 yards and a TD. Tyreek Hill had six catches for 109 yards. Harrison Butker knocked through five field goals. And cornerback Marcus Peters had a hand in two fumbles, giving him a piece of five turnovers in two games since his return from a disciplinary suspension. "It's huge. Everybody don't get a chance to have a seat at the table postseason," veteran Chiefs linebacker Derrick Johnson said with a grin. "We get a chance to sit down, break bread with everybody and hopefully we can be greedy." One of those teams that missed a chance? The Dolphins. Miami (6-9) needed to beat the Chiefs at frosty Arrowhead Stadium and have six other scenarios break their way to reach the postseason, but couldn't take care of the first order of business. "I definitely feel like we left some games out there," said wide receiver Kenny Stills, who had one of the Dolphins' two fumbles. "We have no one to blame but ourselves." THOUSANDS OF MILESTONES: TE Travis Kelce surpassed 1,000 yards receiving, giving the Chiefs two 1,000-yard pass catchers and a 1,000-yard rusher in the same season for the first time. Kelce now has 1,038 yards and Hill has 1,183 yards through the air, while Hunt has 1,292 yards on the ground. AND THOUSANDS MORE: Smith surpassed the 4,000-yard passing mark for the first time in his career, a nice feather in the cap of quarterback often criticized for being a game manager. He also threw his 26th touchdown pass on Sunday against just five interceptions. "The thing I'm most pumped about is the whole offense, all together," he said. "To hit 4,000 passing as a quarterback, that all going on at once, I think is the most special part. Everyone involved." RUN STUFFERS: Dolphins RB Kenyan Drake was coming off back-to-back 100-yard rushing performances, but was held to just 57 yards on 13 carries. Part of that was the fact that Miami spent most of the game playing from behind, but part of it was the Chiefs' game plan. "Our plan was to stop the run," Chiefs defensive tackle Chris Jones said. "We did that and we started to have some fun." TEMPER, TEMPER: The Dolphins' frustration appeared to boil over when wide receiver Jarvis Landry and coach Adam Gase appeared to get into a sideline yelling match late in the game. "It's normal for anybody to show frustration at that point, understanding that this is our season," Landry said. "I'm sure you guys would be frustrated as well. But I wasn't yelling at Adam or trying to show him up." FLAG ON THE PLAY: The Dolphins have been crushed by penalties all season, and they had 11 for 75 yards against the Chiefs. But the most costly came on defense, including four holding penalties that all occurred on scoring drives. "We started moving things forward and then all of sudden we started to shoot ourselves in the foot with penalties," said Dolphins wide receiver Jakeem Grant, who had a 65-yard touchdown reception. "We've just got to get those corrected."